Bogside Flats SSSI (centred on NS3039) is an extensive area of mudflats, salt marsh and grassland adjacent to the Ayrshire coastal town of Irvine. The intertidal habitats created between the estuarine junctions of the Rivers Garnock and Irvine are especially rich in wintering wildfowl and waders, and the grassland encircled by the remnant of the old Bogside Race Course often holds wintering Short-eared Owl. Kestrel and Common Buzzard can be seen all year round. On 24th February 2017 the site was visited to search for owl and other bird of prey pellets: isolated fence posts, scattered over grassland, form regular perching sites, and pellets cast by the bird whilst present, can often be found lying on the grass below. At Bogside many old disused posts are still standing, and these, and adjacent scrubby trees were checked. The weather was cold and wet, and the area to the north and west of the site was searched for around two hours before worsening weather brought the trip to an end. All pellets found were collected, and notes made of other tracks, signs and live sightings throughout the area visited. In total 20 pellets were obtained of varying size and condition. Some pellets were fairly fresh looking, others clearly older and eroded, or fragmentary. Several pellets were discovered lodged in hollows at the top of decaying posts where the bird had left them. The pellets were analysed per Yalden (2003) in the order in which they appear in the photograph (from left to right – see Figure 1), and the results were recorded (see Table 1). With a mixed pellet collection it can be difficult to accurately allocate each pellet to a distinct species of owl or bird of prey. Kestrel and Buzzard pellets are usually easy to identify, but variation does occur, and owls, unless confirmed by a sighting, or feathers found around roosting spots, are at times best recorded as owl species. With reference to the above table, pellets 1-3 have a proportionally long and narrow form and could be assigned to Short–eared Owl: up to two individuals of this species were recorded on the Ayrshire Birding Forum at Bogside during the winter of 2016/17. It was noted that these pellets were beneath a small scrubby tree which may have been a roost site. Pellet 4 contained just the fur matrix and a piece of Field Vole jaw. Its large size means this pellet can be confidently assigned to Common Buzzard. The smaller pellets e.g. numbers 10, 14 and 17 have typical Kestrel pellet remains. Both Buzzard and Kestrel were seen during the visit, and one of the isolated posts carried classic signs of Kestrel predation on Field Vole: plucked tufts of grey/brown fur and the sectioned out and discarded gut. Some of the other pellets had interesting contents: the Bank Vole and Wood Mouse in pellet 8 suggest hunting taking place around more scrubby/bramble areas, and pellet 19 had a completely intact Field Vole skull very much like those regularly found in Barn Owl pellets. The small collection from this visit suggests three or four bird of prey species, and records three small mammal species at the site. The significance of Field Vole as a prey species is evident, and it was observed that the dense thatch of grass was frequently shot with small tunnels and runs typical of the species. Whilst walking over the area, signs of Fox were encountered, including evidence of bird predation in the form of bitten off wing remains. 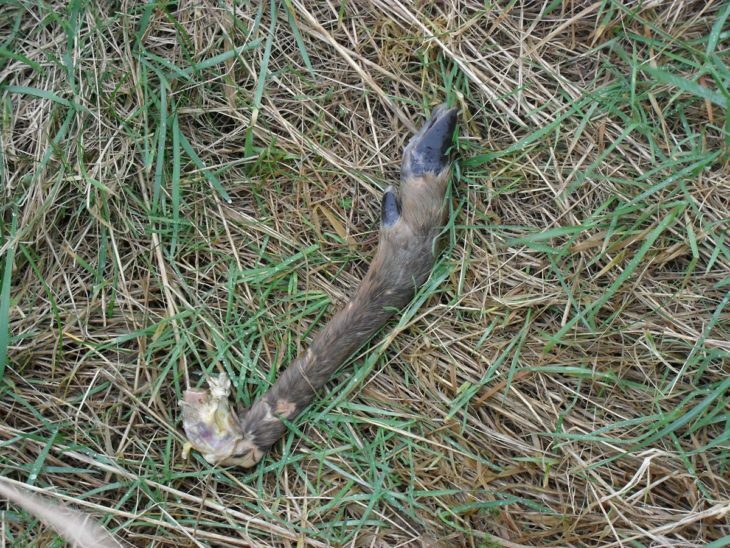 Several Fox droppings (scats) were found, and the scavenged lower leg of a Roe Deer (see Figure 2) was discovered. The above leg, and tracks in muddy path sides, indicated Roe Deer, and during the visit very good sightings of Roe were obtained. An adult buck with antlers coming out of velvet was present, and five does were seen. The animals were observed feeding right out in the open, but when disturbed were very flighty, and leapt off towards the cover of dense reed mace beds. Bogside was visited again on 27th March 2017 during an afternoon of fine settled spring sunshine. Better weather conditions helped with searching the site, and gaps from the previous visit were checked. Eventually a whole circuit of the race track was achieved, and the central grassland was crossed several times, with posts and isolated bushes checked as before. 28 pellets were collected this time, mostly from posts omitted during the first visit (see Figure 3). 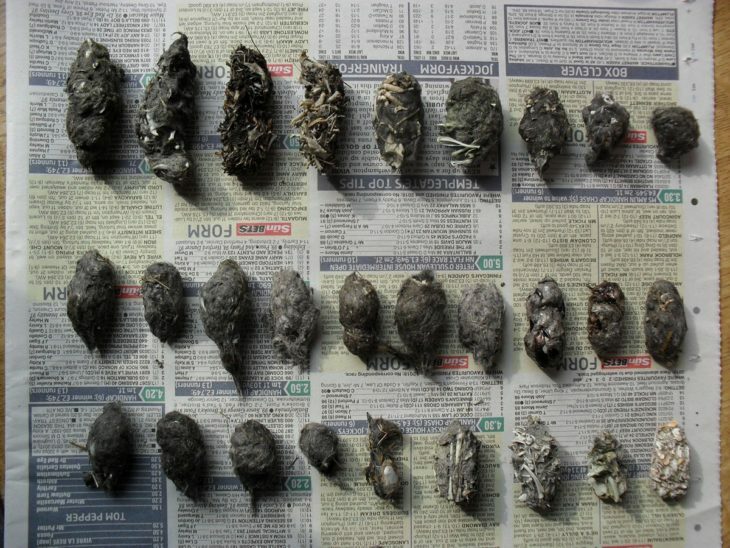 Around half of the pellets were typical Kestrel form, and others clearly contained bird remains which may be associated with species such as Sparrowhawk or Peregrine. One pellet consisted of Field Vole teeth, fragments of crab and small stones. This is most likely a crow pellet. 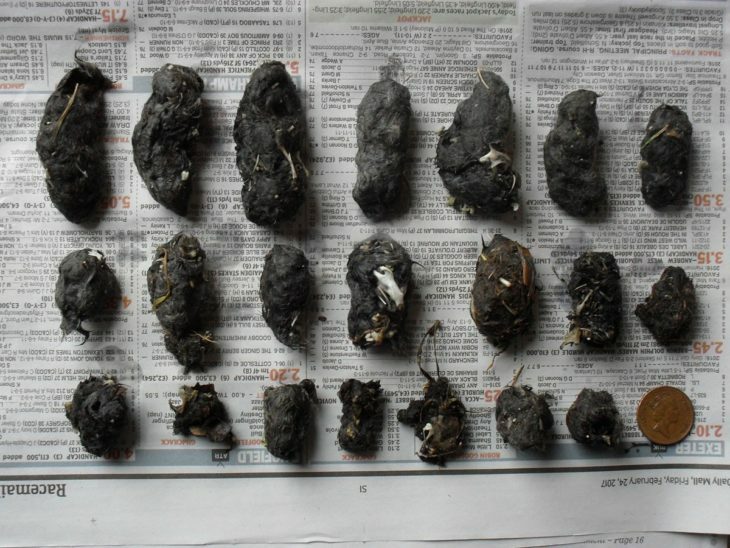 Only the most “owl-like” pellets of this collection, offering convincing mammal data, (top row in Figure 3) were fully analysed (see Table 2). Kestrel (and Buzzard) pellets are analysed using a different method from that of owl pellets: no attempt is made to calculate the actual number of prey items. These pellets, and those containing just bird remains, have been set aside for now. Pellets 1-4 share the same proportionally long and narrow form as several from the first collection, and could be Short-eared Owl. Pellet 5 is of note and contained Mole. This species is regularly found in Buzzard pellets, but the bones were not eroded which suggests owl as the predator species. (During the visit several areas at the site were noted to have clusters of mole hills.) The other smaller pellets were all owl, and contained typical Field and Bank vole remains. 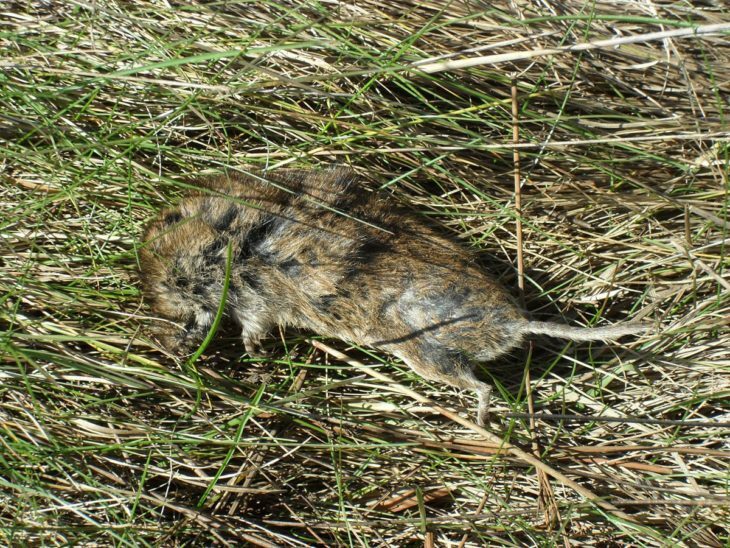 During the visit a freshly dead Field Vole was found (see Figure 4). Note the very short tail. As before, evidence of Fox was noted during this visit, and two groups of Roe Deer were observed: a buck and doe, and a doe with three of last years offspring – two does and, a buck with tiny “button” antlers. Evidence of Otter was discovered at two sites. Both sites consisted of typical blackish spraint material containing amphibian bones, and one of the sites also had further separate spraint material of fragments of crab. It was noted that in both cases the spraint material was deposited where the grassland abruptly gave way to wetter rush and reed mace habitat. Clearly defined “openings” into the rushes were marked by the spraints. Two fairly brief visits to Bogside have resulted in records for seven mammal species (see Table 3). The list can almost certainly be expanded, with a significant omission being that no shrew species were recorded. The habitat is suitable for both Common and Pygmy Shrew, and it is very likely that further collections of pellet material will include both these species. It could be that since the most useful pellets to date are probably Short-eared Owl, then shrews have not been recorded since this owl species tends to have shrews as a very small proportion of total prey. A convincing collection of Barn Owl pellets from the site would most likely reveal the presence of Common and Pygmy Shrew, and possibly Water Shrew. Another omission is that no Rabbit signs were encountered during either visit. It seems unlikely that Rabbit is not found somewhere at Bogside, and further visits may add this species to the list. The species list for the site is a starting point or “baseline”, to be added to as additional mammals are encountered during future visits. All the species listed to date have been recorded using the Mammal Society Online Recording System. I have made a few short visits to Bogside in the past, and collected odd pellets in a random fashion. These visits are intended to be the first of a more extensive and investigative series of visits to gain further experience of one of Ayrshire’s classic coastal wildlife sites, and to build up knowledge of mammal presence. Records for seven mammal species were obtained, and first steps towards developing confidence in navigating the site, and adjoining areas, will be helpful for future visits. Aside from the opportunity to gather biodiversity information, regular visits to Bogside will encourage me to form a relationship with the site, and obtain an understanding of the character of the place: there seems to be a peculiar quality to apparently empty places like the grassland at Bogside: small pieces of information: pellets, feathers, tracks and pieces of shell assume a disproportionately insightful significance. Bang, P., Dahlstrom, P., (1980), Collins Guide to Animal Tracks and Signs, Collins. Corbet, G., Ovenden, D., (1980), The Mammals of Britain and Europe, Collins. Corbet, G. B. (1989), Finding and Identifying Mammals in Britain, 2nd edition, British Museum (Natural History). Yalden, D. W. (2003), The Analysis of Owl Pellets, 3rd edition, The Mammal Society. The original document is available in pdf format from our Resources page and can be downloaded here.